If you haven’t already heard about Indomie’s latest salted egg flavour by now, where have you been? It’s no surprise that everyone’s been going gaga over it, doing their best to snag one of these elusive packets of curly fried noodles. Released under the Premium Collection, it was originally available only in Indonesia, but now you can find it in 22 Fairprice Finest across the country at S$1 per packet. Still though, is it still worth that calorie quota? We did a quick taste test and here’s what we think. Upon opening a packet of regular Indomie and the special salted egg version side by side, we noticed the difference in the type of noodles used. While regular Indomie has thinner noodles, the salted egg version has thicker flat noodles, which we felt was much more suited for sopping up all that salted egg sauce. It comes along with a packet of dry seasoning as well as what we assumed to be the salted egg sauce itself, which was supposedly made up of salted egg and synthetic salted egg flavouring. It smelt incredibly odd, almost foul in the way boiled eggs do when they’ve been left out for too long, though thankfully after mixing in the noodles the smell went away. Instead, the salted egg fragrance became a little more prominent, but “a little” was as far a superlative we could use to describe it. Taste wise, we could only say that we were disappointed. If you were expecting any of the luscious silk rich salted egg sauce normally found in zi char restaurants, sorry but you won’t find that here. While the sauce did make for a much creamier texture and had an added fragrance not found in regular Indomie, there was a distinct artificial aftertaste that grew more foul as you ate more of it. The only other flavour we could taste was the copious amount of MSG that’s signature to any one of Indomie’s instant noodles. A couple of bites in, we decided to give up. 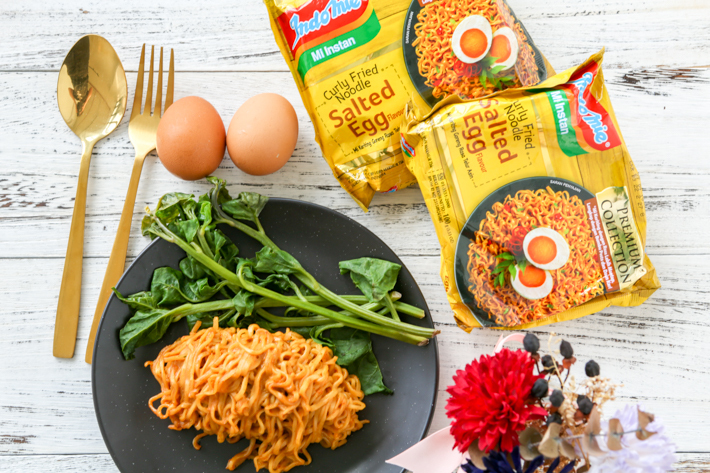 Though the regular Indomie is equally if not saltier and MSG loaded, we’d rather have that over this salted egg version any day. If you still want to try it, it’s now available across 22 Fairprice Finest outlets so you don’t have to haggle on Carousell nor do you have to pay a premium for Airfrov because as premium as it claims to be, we all know better than that. I was also shocked when I tasted Indomie salted egg and couldn’t finish it. If you like spicy, the best is Indomie sambal matah.